Even though we love cooking for ourselves and our friends, we also love dining out! We’ve rounded up our team’s top 5 favorite Vegan restaurants in L.A. along with our favorite dish from each location. Check out the round-up below! There’s a live poll happening now hosted by VegOut LA for LA’s best vegan eateries in 2018, and we are listed in the “best tacos” and “best pop-up” categories! We would love your vote for a chance to win this recognition! My Vegan restaurant first opened in Pasadena in 2009 and was the first vegan restaurant to open in that neighborhood. We love My Vegan’s Tom Yum Noodle Soup with Soy Beef and extra veggies! The broth is a perfect blend of spicy heat and acidity that balances with the rice noodles. You can check out My Vegan in Pasadena or their second location in Eagle Rock! 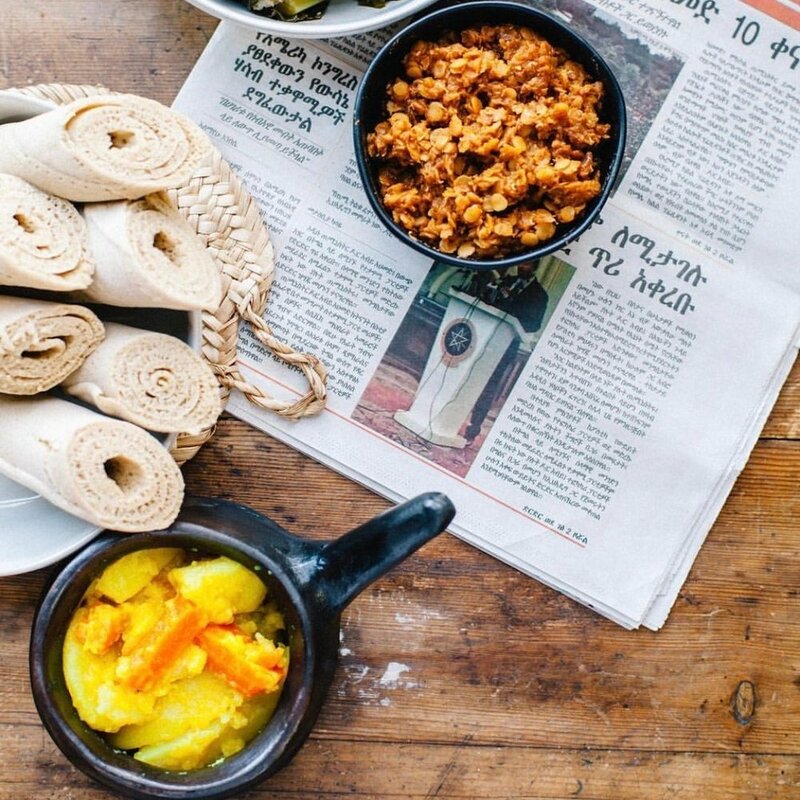 Azla Vegan is a family and woman owned Ethiopian restaurant and catering company in downtown L.A. We love their familial energy and atmosphere, you can really feel the love and traditions instilled in each dish and recipe! We like ordering Misir and Gomen with Injera. The Injera is a spongy and sour flatbread perfect for soaking up their delicious stews, so make sure you choose this side over brown rice! Visit their aesthetically pleasing IG page and be prepared to get hungry! You can find Ramen Hood nestled in the bustling Grand Central Market. This 100% vegan restaurant just about might fool anyone with their vegan eggs! We love ordering their Spicy Ramen with extra mushrooms with their Ahi "Tuna" Crisps. 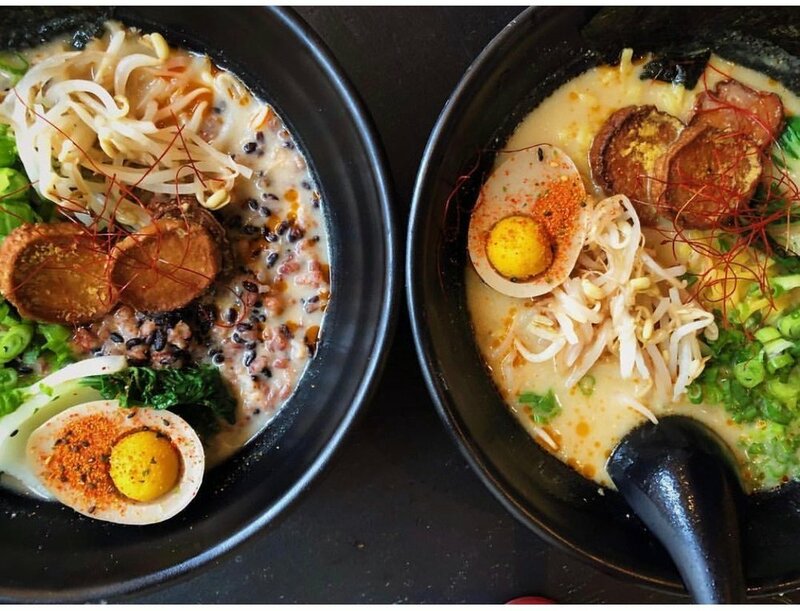 Their ramen broth is made of pressure cooked kelp, shiitake mushrooms, and toasted sunflower seeds that gives their stock a deep umami flavor and beautiful texture. Organix is a vegan grocery store and deli located in Eagle Rock (just a few doors down from My Vegan’s new location). We can’t get enough of their Jackfruit Barbacoa! You can order the Barbacoa in a burrito or in tacos! It’s marinated in a traditional barbacoa blend of spices with a good kick of heat that won’t disappoint! Veggie Life is a small Vietnamese restaurant in El Monte that is always worth the drive. They make all their plant based meats in house and have a secret fish sauce substitute. (They said it was a secret when we asked what was in it!) Their “Chicken” Lemongrass always hits the spot and the Rice Rolls are a must order as well. We hope you enjoyed our current round-up. Please comment below with some of your favorite locations!